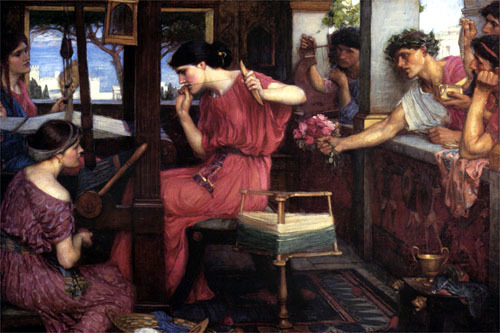 Penelope: Step away from the loom and no one will get hurt. I am in the middle of a BIG project right now. I just call it the BIG project. It’s BIG. It’s expensivem, and it’s all-consuming. Smart Penelope, in an effort to ward off unwanted suitors, used the ruse of weaving a burial cloth for her father-in-law Laertes, and when she was done, she would choose. Cleverly, it was unwoven every night. I am unintentionally unraveling myself every night. Every night, I think about the BIG project. Every moment, I think about the BIG project. I write a little bit. I edit a little bit. I read a little bit and try to make sense of the pattern, the weave, or the texture. What colors do they want? Do they want something complicated, or will they understand some of the nuances? Do I explain everything to the point of over explanation, or are my sequenced commentary, albeit BORING, sufficient to jumping through the flaming hoops? They are the suitors. And somewhat unwanted. But the end result will be worth this journey. A trusted colleague reminded me this BIG project doesn’t really make one a better teacher, although many teacher say it does. I can’t really imagine how; I feel like I was already there, and in some ways, this process hinders my authentic connections with my students. I make an emotional note to myself that every time a student gives me a smile, is excited to work on a project, or shares some burden or joy. I cannot weave those textures into the BIG shroud. Those stitches hold me together, keep me believing, in myself, and what I do. Dang. Now that’s really BIG. Previous Interview with an immortal. Good luck on your BIG project. I think you’ll breath a sigh of relief when it’s all over.